The annual Hoffman Cup game was played this past weekend at St. Lawrence University vs Norwich. 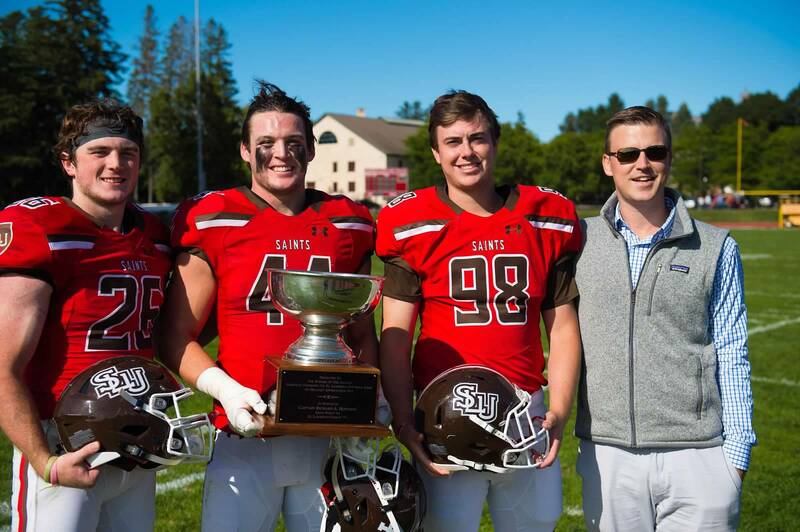 St. Lawrence University prevailed 40 – 7 with the help of former Hingham High stars pictured above. From left to right, we have Sean Murphy, J.P. Reilly, Van Cassell accompanied by Tommy Vangel, an SLU alum and former HHS standout. The Hoffman Cup was established by Hingham’s Tom and Deb Hoffman in honor of Tom’s father, Captain Richard A. Hoffman, on his 80th birthday. Captain Hoffman was a career Captain of freighters, cruise ships, tankers and container ships for over 42 years. He loved the sea and SLU. This was the 15th anniversary of the Cup. 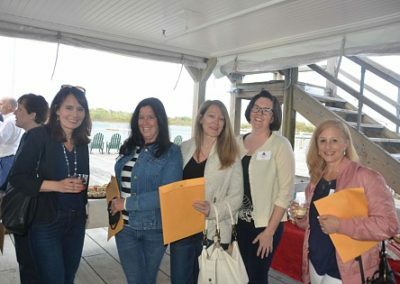 On Thursday May 10th the Hingham High School Football Boosters sponsored a “A True Harbormen Welcome” for new Head Football Coach, Jim Connor. The event, held at the Hingham Yacht Club, was well attended by players’ parents and the new coaching staff. Coach Connor graduated from Boston College, where he also played football all 4 years. He most recently coached at Norwell High School and brings 12 years of experience as a high school head football coach. Coach Connor was selected to coach in the 2013 Shriners Football Classic, selected as South Shore League Coach of the Year in 2016, and selected by the officials (EMAIFO) as Coach of the Year in 2017. Coach Connor currently teaches History at North Quincy High School. 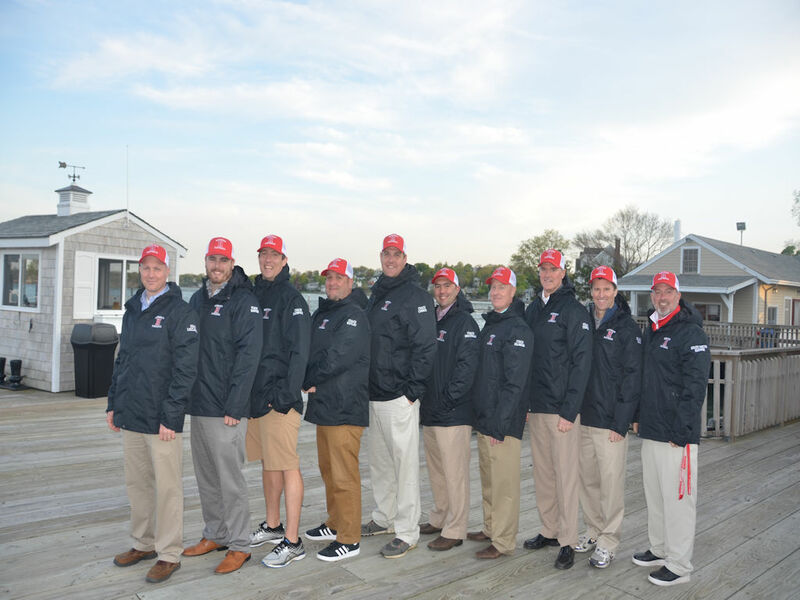 He has assembled a talented coaching staff to lead the Harbormen for the 2018 season. Captains Jack Johnson and Trevor Smith, along with Hingham High Athletic Director, Jim Quatromoni, welcomed and introduced Coach Connor to the gathering. Johnson said “after last year’s great season, everyone was really nervous when our coach left”, and Smith added “we all breathed a sigh of relief when Coach Connor was announced as the new head coach.” Third captain Jonathan Bearden was unable to attend due to a lacrosse conflict. Pre-season kicks off in June and there’s a lot of excitement for the upcoming season! Veritas, Unitas, Caritas (Latin) translates to truth, unity, charity. Keep grinding Zach! College of the Holy Cross.. informally recognized as one of the “Catholic Ivies”. Well done Cole. Griff has obviously taken the off season weight training seriously.